Walking into Jean-Paul Hévin, located just off of Place Vendôme in the first Arrondissement, the ground floor is a chocolate boutique, with a particularly good selection of chocolate bars, truffles, pastries, cakes, macarons, and caramels. Hévin is also particularly well known for truffles made with cheese, and fairly elaborate chocolate sculptures (on this visit, a wide variety of hollow chocolate hearts made with chocolate drizzle). But since this was the outbound trip, we weren’t about to buy a bunch of chocolate truffles to stuff in a backpack for hiking…. 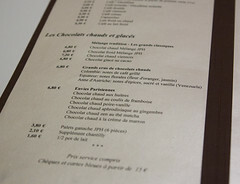 But the real attraction at Jean-Paul Hévin isn’t necessarily the chocolate boutique, but the particularly nice dining area up the staircase, where they serve a menu of prepared hot chocolate (chocolat chaud) cakes, and pastries. And it’s rather a nice assortment of chocolate chaud, with several varieties ranging from their house blend, a Vienna blend, and several spiced or fruit flavored blends, all served up European style as a thick, hearty bowl of chocolate. Additionally, most everything from the display cases downstairs is available in the dining room, so there’s a nice selection of pastries, cakes, and sweet treats to go with your chocolate. After poring over the menu a bit, we ended up making our selections: I went for the house blend of chocolat chaud (Chocolate Chaud Mélange JPH), while Carol opted for the Equateur (with notes of orange and jasmine). To go with this, I opted for one of their cakes, the Bergam (dark chocolate ganache on a crisp, with cocoa biscuit and creamy orange layers with an Earl Grey mousse), while Carol opted to try their Pomme de Terre (a cookie with orange peel, walnuts, raisins, almond paste, made up to look like a potato). Both were delivered quickly. For my selection, the chocolat chaud was everything I was hoping it would be: a large bowl of thick, rich, and incredibly smooth hot chocolate, focused almost entirely on the chocolate with just a hint of milk. It’s rare that I get a good hot chocolate like this (one of the few others I can routinely obtain is from L. A. Burdick Chocolates in Walpole, NH), and this was a solid performer. Add in the Bergam, which was a delicious layered confection rich with a sweet, smooth chocolate flavor, with just a hint of tea and bergamot and just a hint of crispiness from the wafer, and this was a great little treat. 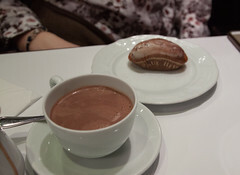 Carol did somewhat better with her chocolat chaud, the Equateur had pleasant notes of orange and jasmine that added to the chocolat chaud without overwhelming it, but the pomme de terre treat was mostly a marzipan-style novelty. Enjoyable, but we were hoping for a bit more from it. 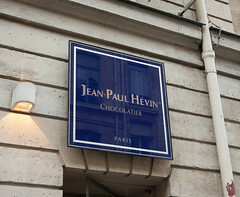 But overall, Jean-Paul Hévin was a perfect mid-afternoon chocolate break for us. 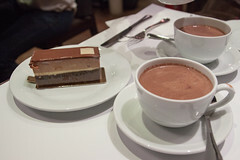 Both the chocolate boutique itself and the dining room upstairs were pleasant, the staff immaculately polite and professional, and the chocolat chaud being a rich, enjoyable treat. I won’t hesitate for a return trip here, or at one of their other boutiques.